Coltsfoot (Tussilago farfara), an introduced and sometimes overzealous harbinger of spring, brightens the monochromatic April landscape with brilliant, sunny blossoms on leafless stems that hug the ground. And though their presence is officially unwelcome in four states, they remain one of my favorite "naturalized" spring wildflowers. 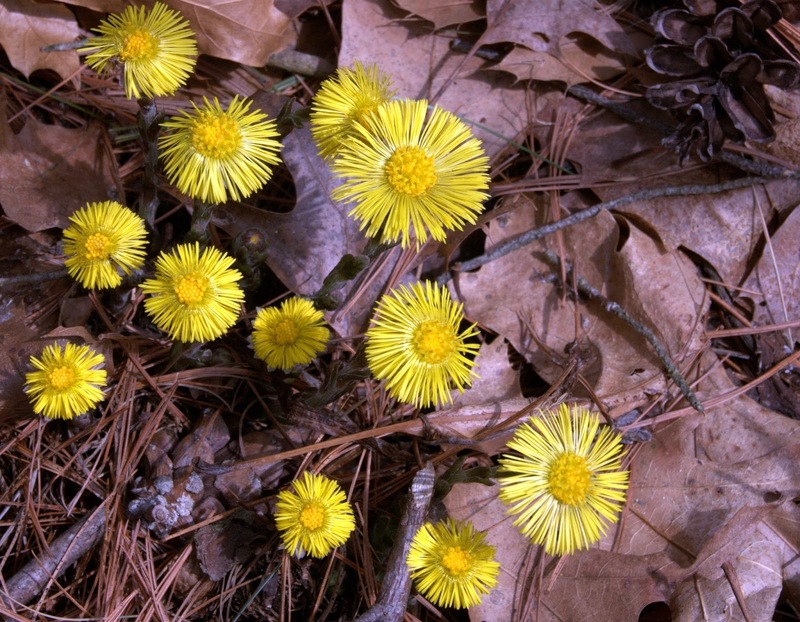 Until 1984, Concord had no official record of coltsfoot (Tussilago farfara) growing within the town. 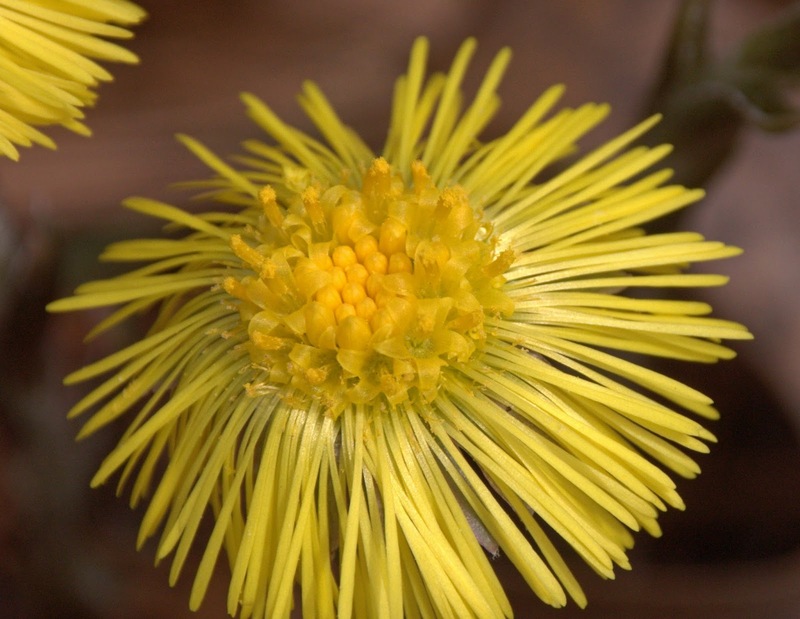 Introduced to North America several centuries ago for its profound medicinal effect on lung afflictions, Tussilago may grow and spread vigorously in early successional areas that are disturbed, sunny, moist, and alkaline. It is listed as a "noxious" or invasive weed in Massachusetts, where its sale and distribution is prohibited. 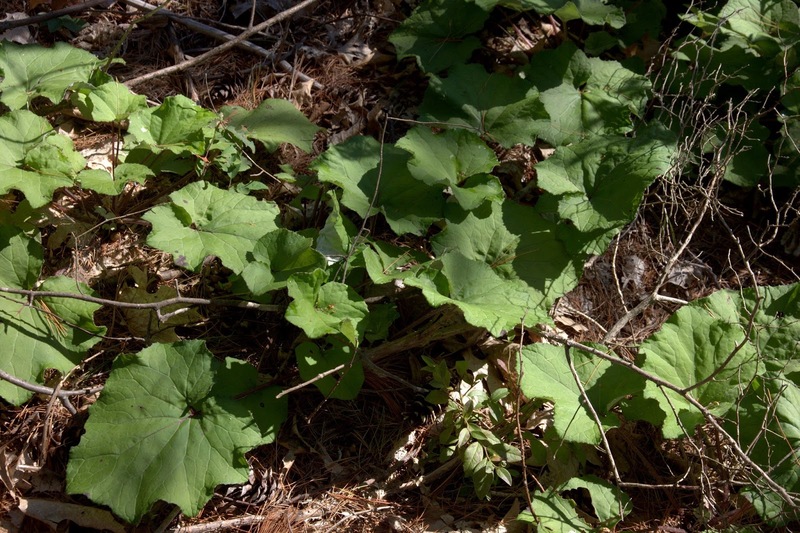 While intensively studying Concord's historic and still extant flora, Ray Angelo found the first recorded patch of Tussilago in 1984, alongside the long abandoned Reformatory Branch RR bed. Minot Pratt recorded having introduced the plant back in the mid-1800's, but no traces were recorded by any of the local botanists who followed him. In October 2013, I found the hoof-shaped leaves of the small patch shown, growing in oak-pine woods on a leaf-carpeted shoreline near the same abandoned RR bed further east in Concord. This month, I set out with my homeschool students to look for the flowers. Each of these small colonies may have been seeded some 40-50 years ago when trains still ran this line through town from Cambridge and the surrounding habitat was more open and freshly disturbed. These two locations are now densely covered with second growth forest and are undisturbed and densely shaded in the summer. 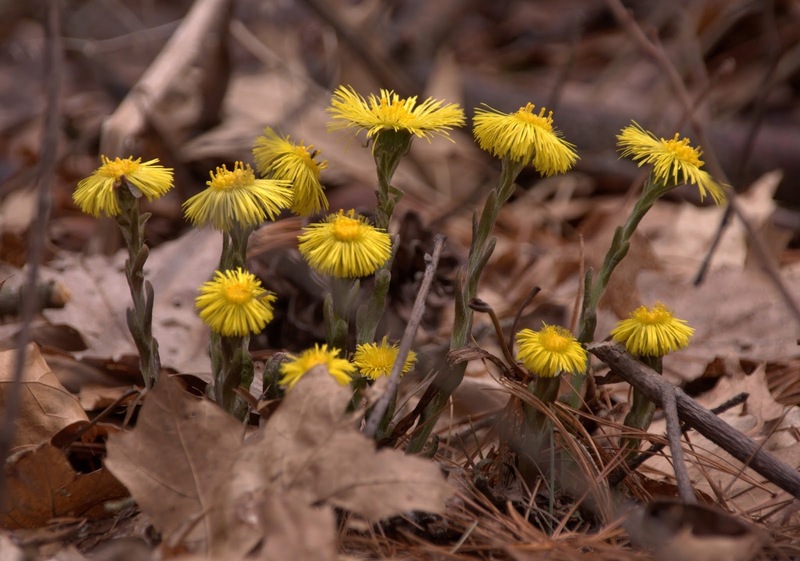 Coltsfoot is no longer apparent in the vicinity of the 1985 colony and it is quite possible that the mature habitat around this year's discovered colony will discourage further spread. This week while out exploring vernal pools with my students, a spontaneous bushwack from one trail to another serendipitously brought us to a third small patch of coltsfoot, some 1000' from an active trainline. Due to the open characteristics of the site and potential for disturbance both by the elements and passers-by, this colony has the most conducive conditions for spreading. Coltsfoot leaves distinctively resemble horses hooves, these photographed on 10.1.13. Coltsfoot's hoof-shaped leaves emerge as the flowers go to seed creating a ground cover through to autumn. Then the plants die back to the roots for winter. Because coltsfoot's adventitious roots are brittle and extensive and spread more vigorously when broken or damaged, experienced habitat assessment and care should be exercised in its removal and management to avoid unintended consequences of promoting its expansion. The plant appears to be a "weak competitor" as invasive species go and it has been found to be self-limiting in stable, shadier, later succession habitats that may grow up around an initial colony. Cool! Forgot , if I ever knew, about the leaves. Just thought they had the little spindly stems!